Robert Farber: I’m here in New York City with a great photographer, Eddie Adams. I first became familiar as many millions and millions of people did by Pulitzer Prize winning photograph that was taken in Vietnam of the Vietnamese Colonel executing a prisoner. That’s when I first started–how long did your career start before that? Eddie Adams: That’s a very good question. I’m one of those people that started taking pictures at the age of about 12. So up until the time that picture was taken I thought I wasn’t a bad photographer, and probably what that picture did is brought more attention to my other pictures than anything else. Robert Farber: When that photograph was taken, who were you on assignment for and how far into your career, how old were you at that time? Eddie Adams: I think I was in my late 20s actually. That was in 1968. Robert Farber: Who was the magazine? Eddie Adams: No, actually I was working on staff with the Associated Press based in Vietnam. Robert Farber: How did that image come about? What preceded that moment? Eddie Adams: Basically what happened is the Associated Press office and NBC were right next to each other in an old German embassy building in Saigon. We used to tip each other off if we’d hear about something happening or a little battle. An NBC film crew and myself went to an area of… which is a Chinese section of Saigon – there was a small battle taking place between the South Vietnamese and Vietcong guerillas right in Saigon. And we went there and found that there was not really much to do, so we spent a few minutes there and started walking back towards our cars. We’re just snipers, more or less, which doesn’t make good pictures. We head back towards the car, and we saw them pull a guy out of a building. We followed the guy, the police grabbed him, and we walked up to the corner and out of nowhere to my left – I was about five feet away – this guy, we didn’t know who he was, reached for his pistol and I thought he was going to threaten a prisoner. I had a 35 mm lens on the camera and it was a full frame. He reached for his pistol, and as he reached for his pistol I took the picture. It turns out that was the instant he pulled the trigger, and the U.S. Army asked for the photograph, they got a hold of his pistol, figured out the speed of the bullet, the shutter speed was like 500th of a second. 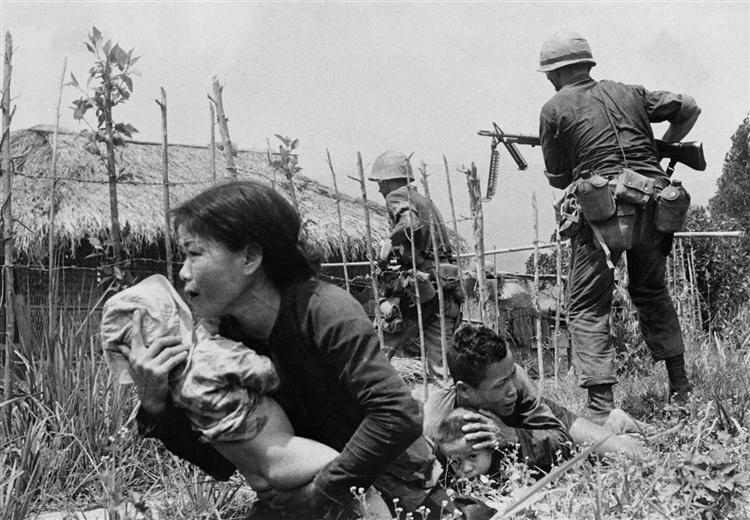 And they said, according the U.S. Army, was that the bullet had not left the Vietcong Lieutant’s head when the picture was taken. Robert Farber: Amazing story. Such a powerful image. And when that happened, what went through your mind at that point? Eddie Adams: Absolutely nothing. Because there was one man killing another man, but that’s what war’s about, and so…it’s good guys and bad guys. That’s basically what war is all about. Robert Farber: So with this photograph, was it a help to your career? Eddie Adams: I think, more than anything else, believe it or not I think it hurt me because what happens, you know as a photographer, we’re all labeled for certain things like an actor for a television series–we’ll take for example, Robin Williams. Robin Williams was a comedian and it took him a long time to break out of that mold, and now all of a sudden he’s a serious actor. I mean, he was pretty good then, but nobody took him serious because he was a comedian. And I think he’s got an Academy Award, and that’s terrific. I’m just using that as an example, and the same holds true for photographers. 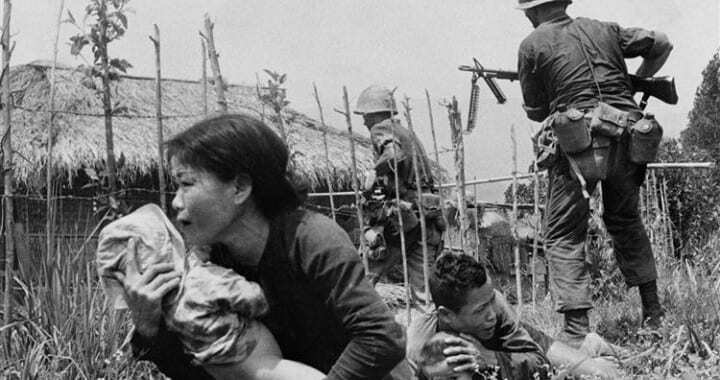 Maybe the picture of the General executing the Vietcong Lieutenant drew a lot of attention to me, but it also labelled me as a war photographer. Robert Farber: So that labelling and that pigeon holing of a photographer and their style and their career and everything else–I understand what you’re saying. Eddie Adams: Well basically, what I said what happens is that when you’re labeled like that nobody’s going to call unless they got a war. So, you know, go take pictures of another war. Well, just a little background, the Gulf War was probably my 13th war. The biggest problem is magazines don’t run war pictures every day. So I was fighting this battle to get away from the war. I’ve done a lot of essays, and the past 15 years I guess, a lot of celebrities. Robert Farber: What’s your favorite type of assignment? Celebrities, essays…? Eddie Adams: There isn’t any favorite type. I enjoy everything. And this, I think photojournalist is a very bad name. It wasn’t that many years ago that the word photojournalist was created. The only reason it was created, as a photographers were always second class citizens on a newspaper or on a magazine. It was the word people, the writers that were the stars, the photographers were never really stars, even at LIFE magazine, when you come right down to it. For lack of a better word, the word photojournalist because the photographers were aways called, from a reporter, “my photographer,” and so they came up with photojournalist. I think photojournalist is a very bad word, because if you’re a good photographer, you’re a good photographer, whether you’re taking a picture of a war, a still life, a model…fashion. You’re either good or your bad, and I don’t like this division of someone who is a portrait photographer, an art photographer. Maybe that’s that a photojournalist is, because he has to do a little bit of everything. You have to accept new challenges, and I did some stuff for Penthouse. I’ve done a little bit of everything. The main reason I did it is I have to tell people that I’m not a bad photographer, just give me the assignment, we’ll produce it, and you’ll be happy. And so I think this is what it’s all about because it’s full of challenges. Eddie Adams: It’s really true. That’s my problem, I don’t know. I really enjoy everything. One thing I’ll tell you honestly, I say one thing I don’t like–I don’t think I have the personality or anything to do still-lifes. Basically, other than that, as long as people are involved, see because you have to remember they have architectural photography, but I think the picture of a beautiful building but…somebody made that building. That’s the person who created the picture, not the photographer, the person who made that building. And then you have the light from the sun…God created that light, not the photographer, but the photographer went there and just took a snap of it, and all of a sudden he’s an architectural photographer. Eddie Adams: Yes, but also one other thing, I think that picture, even of a building, is not that great unless a person was in it. I like to take pictures of ladies, and I think I’m pretty good. I’d really like to be Robert Farber:, Jeff Dunas and Doug Kirkwood because I think you guys have really cool assignments, and I think I can stand up against all three of you. Robert Farber: Let’s have a shootout. But you know what I really wanted to say–the grass is always greener and I see some of your images of the Pope and Fidel Castro and I say those are important images, and this makes me say I want to be Eddie Adams. Robert Farber: The internet workshop has many people doing portraits, nudes, still-lives, landscapes, but we have photojournalists, and the people that are photojournalists–I don’t want to use that term because I know what we’ve gone through with it–for those out there who have career interests in going into this–can you tell us something about the Eddie Adams workshop? Eddie Adams: The workshop is–a lot of people don’t know–this is actually our 12th years coming–and it’s free. It doesn’t cost a penny–I mean for the students;we have sponsors who take care of that. But the workshop, in order to apply, you have to be either–we don’t care if you’re 98 years old, if you’re going to change your career and prove to us that you are a student at a university, you’re eligible. And same with a working professional, with only two years or less of experience. You apply, and you join about 1,000 people who apply every year from all over the world. We select 100, and it’s a 4-day intensive course. Robert Farber: From what period of time during the season? Eddie Adams: It actually takes place during Columbus Day weekend every year. Robert Farber: How can they apply? Do you have an address on the internet that they can look at? Or what do you suggest? Robert Farber: Email you I believe, I think that’s the way I always get in touch with you too. And it’s at [email protected] Just to change face a little bit, I’ve seen some of the spectacular and dramatic portraits you’ve done of such great leaders and so forth–let me ask you, what are some of the favorite portraits you’ve done or who you’ve worked with. Eddie Adams: Probably my favorite was done several years–it was of Fidel Castro. I had spent a few days with him, and also went duck hunting with him. Eddie Adams: Actually, he’s a pretty good guy. The interesting thing about Castro that a lot of people don’t know that he speaks perfect English. He had gone to Columbia University which a lot of people don’t realize, it was a long time ago. He’s a real likable, funny, funny guy with a great sense of humor. Robert Farber: So you’ve had a lot of experience and time with Castro it sounds like. Eddie Adams: Well, I just thought a lot of him, you know, he’s a dictator, so what–he’s a pretty cool guy. But when I was with him actually we went duck hunting and he killed 76 ducks in three hours. He only missed one, he was really upset. But what happened at the very end, we had duck for dinner actually, and during dinner he asked me in perfect English, he said (this is taken during the Reagan administration) and he leaned over to me and he said, “Did you ever deal with President Reagan?” and I said, “Well, once in awhile.” He’s shaking his head, he said, “Well, does he have a sense of humor?” And I said, “WEll, I think so.” He started stroking his beard, and he said very serious, “The next time you see him, will you please tell him that I really do respect him.” Then he leaned back, starts stroking his beard some more, and then he said, “For having a sense of humor,” and bust out laughing again. But anyway, it was fun working with him. Robert Farber: Any other stories of great people that you could share with us? Eddie Adams: One of the other people, just a couple years ago, I had some time with the Pope at the Vatican. It was private session, I was told that I was one of the second photographers to have private time, so I was kind of excited. A little nervous too. And what happened is, the monsignor who handles all the press people gave me 35 minutes with him. I don’t know many other Popes, but with somebody with such high stature, you usually get like 15 minutes, it’s a big deal. So I said, “Wow, 35 minutes.” He said, “No, no no, you misunderstood me, you have 5 minutes with him.” And this is after waiting in a hotel room for a week in order to do this, and it turned out to be 5 minutes. We got less than one roll of film, and at that time I think I shot him on 120, so it’s like less than 12 frames, and half of them were a little screwed up because the writer was there and I had all my lights set up and I was shooting very slow to mix daylight with strobe, and as soon as the writer would ask him a question he would turn his head, so I”d have a nice blur. So we had like half of a half of a roll of pictures of the Pope. Robert Farber: That leads into me asking some questions for our students who want to find out–first of all, do you shoot with negative film or transparency film when you shooting in color. Eddie Adams: I use almost all transparency film only because I don’t know how to shoot negative color. I haven’t done it. So the only time I use negative color is if I’m doing point and shoot or just play pictures, but I hear negative color is very good. Robert Farber: So you don’t use your disposable camera any more? Eddie Adams: Well…if you’re really unsure, then use that, and I’m sure you’ll get a good picture out of it. Robert Farber: As far as you book projects, what’s going on with it now? Eddie Adams: I have actually two books that started, but I’ve never done a book in my life because there’s never enough time. And I hate these people who do these books because they want their past. Eddie Adams: Right. But anyway, I’m working on two books. One is black and white portrait book on human rights leaders all over the world. A lot of them are being done in New York and Washington, but we will start on the road to South Africa and India and various countries to do the black and white portraits and Random House is publishing that and it’s done with Carrie Kennedy Cuomo who’s in charge of Robert Kennedy Human Rights Award every year. She’s doing the interviews and I’m doing the pictures. That’s one of them. The other book we’re just starting to repair is done with Pierre Matisse who is the grandson of Matisse the painter. We are recreating, honoring Matisse’s paintings in photographs. And we’re starting on the project as soon as we get settled with my new place. Eddie Adams: Thank you. This is a, it’s sort of live/work situation and it takes place in an old New York City public bathhouse which was built in 1904, and the city of New York, that was when there wasn’t a lot of plumbing in the neighborhood, and immigrants would come here, so the city of New York would give everybody a free bath. It was used as a warehouse when I bought it, it was a gutted building, and for the past few years actually, we’ve been doing some work with major construction started little over a year ago, and we’re just about complete. It’s decorated, everything, and all the pieces, some of the architectural pieces come from old movie theatres, 90 years old, one chandelier is from a 42nd street movie theater, it was just torn down for Disney. Light is from a movie theater in LA, doors from a bank in 1870, we tried to build in some artifacts. But basically what it is– after we’re building all this it seems we might have to rent out some space here to pay for it, but it’s just 11,500 sq ft.
Robert Farber: You are making it available as rental sometimes. Eddie Adams: Well, we’re just going to be particular who we let in here. Robert Farber: Can I try to shoot something here? Eddie Adams: We’re thinking about it. Robert Farber: I must tell you that with all of these different elements you’re mentioning, the overall architecture from the original outside looks like the J.P. Morgan library on the outside, and then when you walk in the architecture and the design elements are really incredible. I’m excited by it. I wish it was mine. Eddie Adams: It’s pretty cool. Robert Farber: Let me get to a couple of questions some of our members would really like to find out from you. First of all, when you’re about to shoot a subject, do you try, if you can of course, do you try to spend time with them before you’re shooting? Eddie Adams: That would be ideal to spend time because I think if you do spend time with a person–and you’ll notice most people’s, their best pictures are generally their family because they catch them a little bit off guard or their unaware of the camera. Robert Farber: Not according to my family. Eddie Adams: But the ideal situation is to be invisible. If you were invisible, and you had a film built in the back of your head or little disk from a digital camera, you could take great pictures. Because everybody wants to be look good in a photograph, and they prepare themselves for you and when you get them, they have a different suit on or a different dress, because they want to look good and it’s forced. It’s a very terrible terrible thing. But if you can spend some time with them, get them relaxed ahead of time, it’s always better. Robert Farber: What advice would you give to someone starting out in photography from your point of view? Eddie Adams: I’m not one to give up negative advice like a lot of picture editors do. I think that there’s a lot of room, for anyone who’s really serious about this and who first of all to be successful in anything–and in photography it’s gonna hurt. You’re gonna cry, you’re gonna have your heart ripped out, but just don’t give up. If you have the will and the time and are really serious about this, the most important thing is you have to want it bad enough. If you want it bad enough, you’ll get good, and get to where you want to go. Eddie Adams: There’s just one other thing: if you’re beautiful and your pictures aren’t that good, don’t give up. Send us a headshot of yourself, and there is a possibility–we’re looking for models for the Matisse book, so send us a picture, so don’t give up hope. Robert Farber: Hey, who said you could find models through our interview here? Eddie Adams: How do you get yours? Robert Farber: Well, you’ll have to join my workshop to find out. Thanks Eddie. 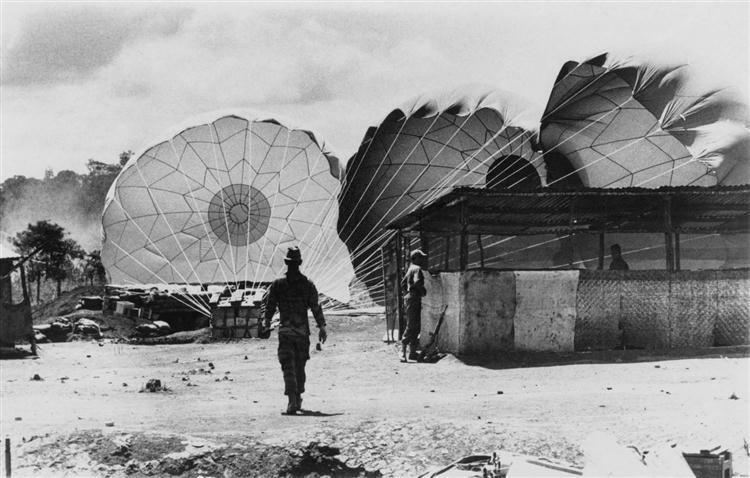 Eddie Adams photographed 13 wars, including Vietnam. 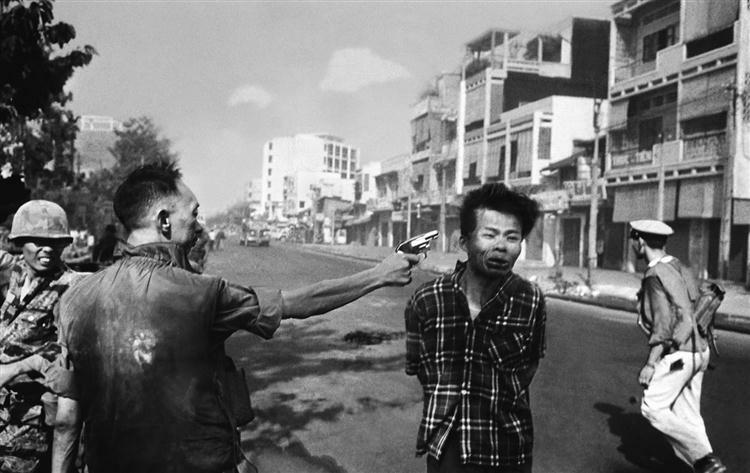 He won a Pulitzer Prize for his 1968 photograph of Gen. Nguyen Ngoc Loan executing a Viet Cong prisoner in Saigon. The prisoner had just murdered eight South Vietnamese. The photograph turned some Americans against the war and haunted Loan for the rest of his life. Eddie Adams died in September, 2004. Posted in Interviews, War Photography and tagged Eddie Adams, Interview, Interview E, Robert Farber, War Photography.